Seeing how at that point Quirrell was inhabited by the "main" fragment of Voldemort's soul (and that fact was something 100% clear and obvious from "HP&SS" book), does the statement above mean that somehow there actually were *two fragments of it in Quirrell, one "main" and one "Horcrux"? * If not, then what's the "reveal" part? 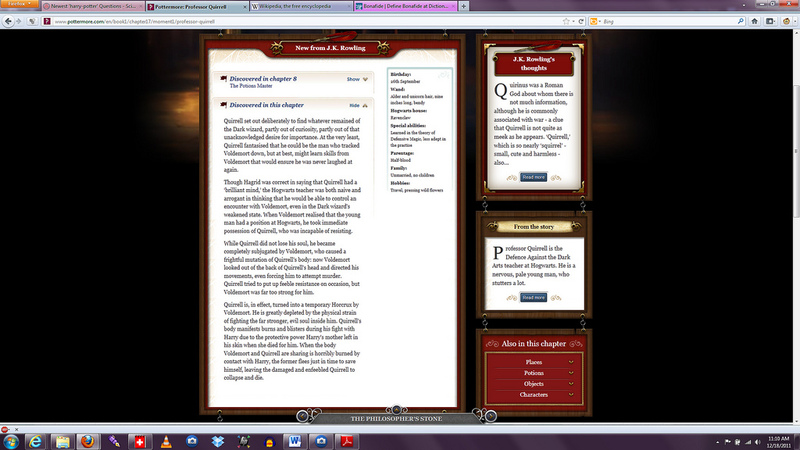 SCREENSHOT - Pottermore - Professor Quirrell Pottermore SPOILERS, obviously. NOTE: To best view this screenshot, you'll want to save it to your computer and view it there. The actual image is 1920x1000 px. Flickr limits the display size of pictures and it's hard to read easily just by viewing it on Flickr. Quirrell is, in effect, turned into a temporary Horcrux by Voldemort. He is greatly depleted by the physical strain of fighting the far stronger, evil soul inside him. Quirrell’s body manifests burns and blisters during his fight with Harry due to the protective power Harry's mother left in his skin when she died for him. When the body Voldemort and Quirrell are sharing is horribly burned by contact with Harry, the former flees just in time to save himself, leaving the damaged and enfeebled Quirrell to collapse and die. I think your question is open to interpretation, actually. We know that during SS/PS, Voldemort was not corporeal, hence him needing Quirrell's body. I suppose I see Voldemort at that point as some kind of entity that retained Voldemort's essence and his soul. If one were to read the Pottermore text literally, then it's "soul," singular. However, jumping forward to the later books, we learn that Voldemort rendered his soul very unstable by the sheer amount of Horcruxes he had created. He lost control of his soul (for lack of a better way of putting it) when he attempted to kill Harry, and that rogue piece of Voldemort's soul detached itself and transferred to Harry, making Harry a Horcrux. Is it possible that what soul that remained in Voldemort was so unstable that perhaps it wasn't all in one piece, or perhaps it was cycling between states of being one unstable piece of soul and being fragmented? Maybe. It might be like taking apart an orange, segment by segment, and then trying to put the orange back together again. The orange may be back in its original shape, but its no longer strong like it was before it was segmented. It's not fully intact and if you leave it sitting there long enough, eventually it's going to somehow fall apart or shift or collapse because it no longer has the connections that held the segments together. No matter how many times you reshape the orange and put it back together, it's going to fall apart again. Sorry if this is a bad analogy. I think that if Voldemort's soul was unstable enough that it could have been at times fractured, then yes it's possible that Quirrell's body housed more than one Horcrux piece of Voldemort's soul at some point. No, I'm pretty sure she meant a "horcrux" as in a physical object holding a piece of his soul, in this case it just happened to be the main part. The whole story with Quirrell happened long before Horcruxes were revealed. I would simply take that as clarification as to how Voldemort and Quirrell were merged. Quirrell held the Dark Lord’s main soul. Though there was a piece of the Dark Lord’s soul in Quirrell, it wasn’t a separate split-off piece, it was his main soul - the part that was in his regenerated body and had hidden in the forest. The Dark Lord possessed Quirrell, meaning his main soul was inside Quirrell, sharing his body. There’s nothing that implies Quirrell had more than one piece of the Dark Lord’s soul in him - it seems most likely to be just the Dark Lord’s main one that possessed him. There was nothing that had happened to split the Dark Lord’s soul further between his hiding in the forest and his possession of Quirrell, so it’s very unlikely that he’d have a separate, additional piece of soul in Quirrell as well as his main soul possessing him. Why isn't Quirrell considered a horcrux? Where did Voldemort's soul appear? How could Voldemort's soul survive in Harry's body as a Horcrux for 17 years?